With this Magento 2 Akeneo Connector Add-on, you can create group and bundle type products in Akeneo and export them to Magento store. Magento 2 Akeneo Connector Add-on enables the export feature for the Group and Bundle Products. It export Bundle Products on Magento 2 Store using CSV export and group product using the normal product export job. Node and Yarn packages need to be installed. Please follow these steps for installing Magento 2 Akeneo Connector Add-on module in your Akeneo PIM platform. Unzip the respective extension zip and then merge “src” folder into the Akeneo project root directory. 4 – You have to navigate first to Akeneo installation directory (Ex: cd /opt/bitnami/apps/akeneo/htdocs). After SSH, you have to run the command to your Akeneo server by the terminal. Note: Akeneo Magento2 Group Bundle product Add-on only support for the product export feature. You can only export the Group and Bundle products from Akeneo to Magento2. After successfully installing the Akeneo Magento2 connector and Akeneo Group Bundle Product for Magento2 module in Akeneo, you need to set up the Magento API credentials in Akeneo. Please log into Akeneo and follow Magento 2 Connector>Setup Credentials. In Hostname, you need to enter your website URL and then enter the Magento API Integration Tokens as created. To create a product in Akeneo, go to navigate to Products and click Create button. Now, you need to choose product type – as Product, Product Model, Bundle Product, and Grouped Product. Here you can select the Bundle and Grouped Product option to create the product. Bundle Products: A Bundle product is a collection of simple and implicit products. Now it is possible to create Bundle products in Akeneo. For it, you have to create Bundle Products in Akeneo and export to Magento2 using CSV Export Job. Example: A personal computer system. Grouped Products: A group product is a collection of simple product that presented as a group. You can also create group products in Akeneo and can export it to Magneto2 using Simple Product Export / Quick Export Job. Example: A T-shirt set with different size. Note: For creating a Grouped product or Bundle product in Akeneo, you have to first export the all the child product related to Grouped or Bundle product. For creating Group Product, you have to navigate to Akeneo Dashboard -> Product -> Create product and select the Grouped product. Here you have to enter the details of Grouped products. Now you have to assign a category to this product. Now you have to select the Simple product along with the Grouped products. You can add more than one products and product will show on this page. Now to export your product data you need to create a job profile and execute it. 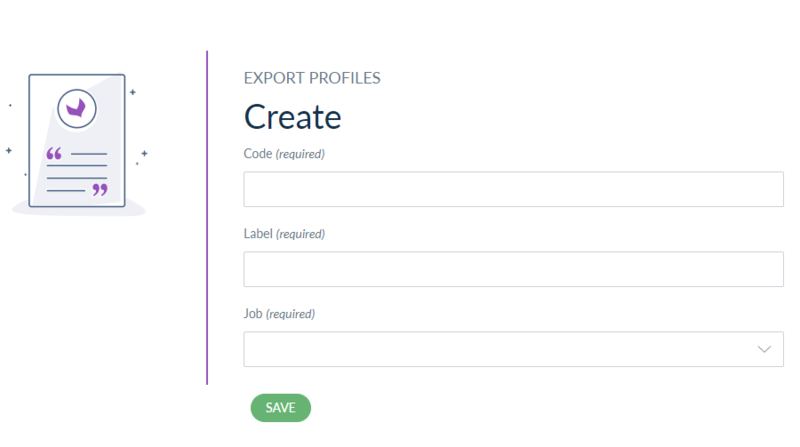 First, go to Exports>Create Export Profile and enter a unique code, label and select a job profile. To know more about Export profile, you have to follow our Magento2 Akeneo User Guide. For the Grouped product export process, you can create a simple export process. To know more about the creating export profile follow our Akeneo Magento2 User Guide. Wait for the execution process to complete and check the errors. After the completion of the export job, the products will appear in Magento catalog. As you can see that the following Grouped products have been imported from Akeneo. The admin can view the products and make any changes in product edit form of Magento. You can see here the Grouped product exported from Akeneo. Here you can see the product attached to the Grouped products. You can see the Grouped product details at the front end of the store. For creating Bundle Product, you have to navigate to Akeneo Dashboard -> Product -> Create product and select the Bundle product. Here you have to enter the details of Bundle products. Price View – Price View defines the conditions required for special pricing. You can check the product with the price ranges like As Low as. The product will show with lower to higher price ranges. Dynamic SKU – The Dynamically SKU will be set to generate the SKU automatically. This allows you to create the Magneto product SKU based on the Bundle product name. By enabling this icon, it will generate the dynamic SKU in Magento2. Dynamic price – You can calculate the price dynamically in Magneto2. The price of the product will depend on the value of the option. If you select the product, It will automatically generate the price. Dynamic Weight – Like Price and SKU, Weight can be also set dynamically. The product weight will change with the selected product option. Ship Bundle Option – With this, your products will show in Magento either together or separately. Separately – It will show product separately in Magento2. Together – It will show the product together in Magento2. Now you have to click on the add option. Here you have to enter the data like option title, Input type, and add the product to option. Option Title – It shows the Bundle product title. Input Type – Here you have to select the input type. With this option, you can choose the product. Add Product Option – You can click here to add products. You will able to select the simple product, variant products, and all child products of a variant individually. You can also filter the product with categories, families, completeness, SKU, and status. Now you can see the product associated with Bundle products. Now you can assign a category to this Bundle product. As you can see that the following Bundle products have been imported from Akeneo. The admin can view the products and make any changes in product edit form of Magento. Now you can see the Bundle product in Magento2 exported from the Akeneo. Here you can see the product attached to the Bundle products. You can see the Bundle product details at the front end of the store. You have to click on the Customize and Add to Cart button to Choose the Bundle Products. Here you can select the products related to the Bundle products.